Ayrshire giants Glenafton needed a stoppage time winner to knock Cumbernauld United out of the Scottish Junior Cup at Guy's Meadow on Saturday. Cumbernauld went into the second round tie as the underdogs, but no-one seemed to have told the United players that given their performance. 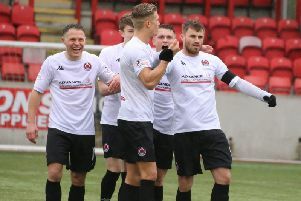 And this was despite going behind in the fourth minute when a ball played in from the left landed at the feet of Glenafton striker Ally Park who dispatched it past diving Cumbernauld keeper Kenny Giles. This setback didn’t deter Cumbernauld and they took the game to the opposition. Captain Paul Murphy led by example but his long range effort went wide of the post. There were chances for both teams. Glenafton hit the bar with a header while for United there was a driving run by Tony Stevenson who picked up the ball in his own half and launched an attack with a series of one twos involving both Conor Stevenson and Bryan Prunty before his effort was cleared away by the defence. The visitors went in at the break still one up, but United came out like an express train in the second half. Within the first two minutes they had a tremendous strike from Scott McManus turned past the post by the keeper and a Kieran McAlleenan shot slide past the post. When another strike from McManus went wide of goal, the United faithful could have been forgiven for thinking it wasn’t going to be their day, especially when a Jamie Kennedy cross then found Stefan Law unmarked in the box, but with only the keeper to beat he headed past the post. But on the hour the equaliser came, and what a goal it was, Kennedy picking up the ball right and turning inside a defender before firing in a terrific shot that left the Glenafton keeper flapping at fresh air. Cumbernauld piled on the pressure but the second goal just wouldn’t come; a Scott Davidson shot went wide and a shot from Law came off the post. Right on the 90th minute McAlleenan with a great chance to wrap up the game, but headed wide when it seemed certain he would score. And with four minutes played in injury time, mostly due to an injury to United keeper Giles, there was heartbreak for the home side when a tremendous free-kick strike from Kyle McAusland left Giles beaten at his left hand post. Cumbernauld had given it their all and it wasn’t to be, but their performance showed that they can more than hold their own against a team from the higher league.